What computer is being used on the Curiosity Mars Rover? The electronic brain controlling NASA’s Curiosity Mars rover has far less horsepower than the microchips typically found in a modern smart phone. But the RAD750 PowerPC microprocessor built into the rover’s redundant flight computers has one enormous advantage: It was engineered to be virtually impervious to high-energy cosmic rays that would quickly cripple an iPhone or laptop computer. The radiation-hardened single-card computers, built by BAE Systems in Manassas, Va., are designed to withstand charged ions and protons in interplanetary space or on the surface of Mars that can physically damage integrated circuits or trigger so-called “bit flips” in which the logic of the computer can be temporarily, or even permanently, disrupted.The RAD750s also meet lifetime dosage standards that are up to a million times more extreme than those considered fatal for a human being. 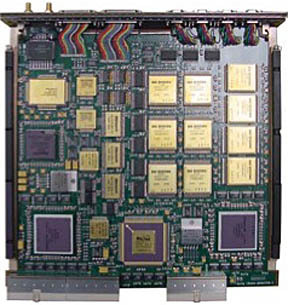 As a result, over a 15-year period, the RAD750 chips aboard Curiosity would not be expected to suffer more than one external event requiring intervention from Earth. Engineers at NASA’s Jet Propulsion Laboratory in Pasadena, Calif., plan to spend the next four days loading a major software update into Curiosity’s redundant flight computers, flushing out the no-longer-needed entry, descent and landing application and replacing it with software optimized for surface operations. The R10 update includes programming to operate the rover’s sample acquisition instruments, its robot arm and its six-wheel drive system. The new flight software was uplinked to Curiosity while the spacecraft was on the way to Mars. Starting late Friday, engineers will begin installing the R10 update in stepwise fashion, first on one computer and then on the other, testing as they go along to make sure all is well. “Right now, we have the capability of just our basic surface software to check out the health of the instruments, but we don’t really have the capability to go and make the full use of all this great hardware we shipped to Mars,” said Ben Cichy, a senior software engineer at JPL. The rover is equipped with two computers, but only one is active at a time. Both are built around a radiation-hardened BAE RAD750 microchip operating at up to 200 megahertz. Each computer is equipped with 2 gigabytes of flash memory, 256 megabytes of random access memory and 256 kilobytes of erasable programmable read-only memory. The BAE-provided RAD6000-based computers aboard the Mars Odyssey orbiter and the Spirit and Opportunity rovers are 10 times slower and feature eight times less memory than the RAD750 cards aboard Curiosity. The more powerful microchip also is used by NASA’s Mars Reconnaissance Orbiter and will be integrated into the James Webb Space Telescope. While their technical specifications appear to lag well behind the chips used in readily available consumer electronics, those devices don’t require anywhere near the rigorous design work, testing and qualification that goes into a space-rated processor. “First, you have to develop the radiation hardening techniques and actually implement them in the design,” said Scott Doyle, a BAE systems engineer for satellite electronics. “The next step is you have to qualify each of those individual components and that qualification is normally a year, a year-and-a-half, just to do that. The resulting computers can cost anywhere from $200,000 to a half-million dollars. While all that might seem like overkill to an outsider, space-based computers simply have to work. “There’s no repair man in space,” Doyle said. But given the unavoidable limitations in processing speed and memory, Curiosity’s programmers face a daunting task when it comes to writing software. “What’s hard about this, my phone has a processor that’s 10 times as fast as the processor that’s on Curiosity and it has 16 times as much storage as Curiosity has and my phone doesn’t have to land anything on Mars,” Cichy said. “All my phone has to do is follow (a friend’s) Twitter feed. If all goes well, the R10 software update will be complete early next week. Looking down the road to future spacecraft, BAE Systems is developing a quad-core processor for space-based applications that will run at gigahertz speeds and be capable of an enormous number of calculations, or instructions, per second. The new computers will be especially useful for image processing. “It’s really going to be a matter of MIPS, that’s million instructions per second,” Scuderi said. “For the RAD750 today, the MIPS can get as high as 500. We’ll go into the gigabit, or gigamip, or gip, I guess will be the next (unit). Billions and gazillions how about that?” he joked. We need oxygen for our Mars colony.